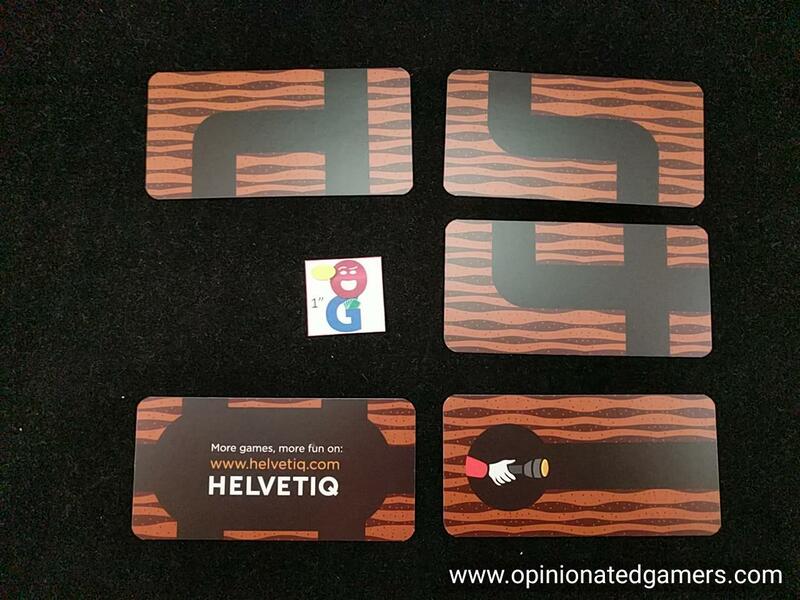 This year at Essen, I stopped at the Helvetiq booth to check out some of their small format games. One of the joys that I’ve re-discovered this year are the fun that can come in small packages. I have been looking through the entries in the Mint Tin contest on BGG, and I spent a bit of time searching the stands at Essen looking for other small packaged games. 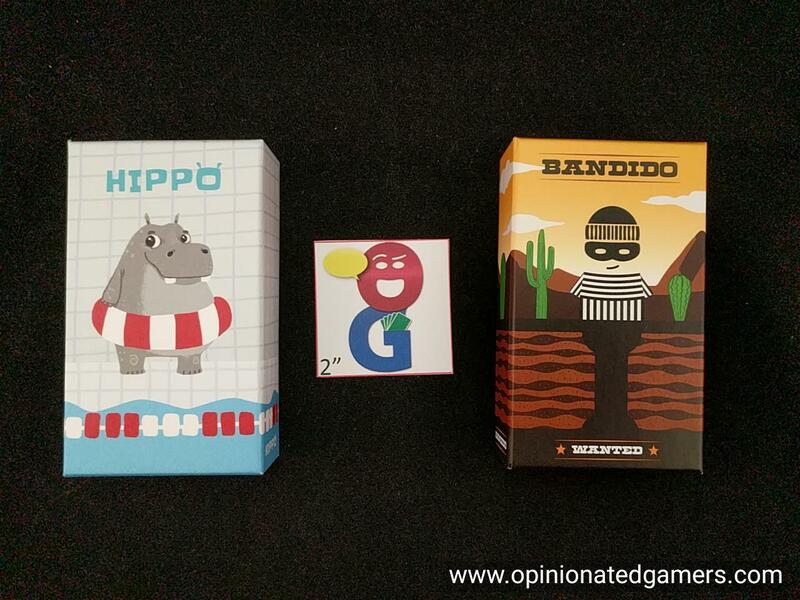 Helvetiq had eight to ten different small boxed games, and after reading up on them, I decided to try out Hippo and Bandido. Both of the games are slightly thicker than a deck of cards, so they might be better suited for a jacket pocket than your jeans pocket – but they are still both eminently portable for a bit of gaming fun in small box. In this small box, there are twelve tiles (numbered 1-12) which make up the game board. Spaces 1-6 have three spaces per tile, while spaces 8-12 have only two spaces per tile. The number 7 space has a big smiling hippo on it. There are also three small d6 in the box as well as twelve life preservers each for four players. To play the game, the board is first constructed by laying out the tiles in numerical order. Then, on a turn, the active player rolls all 3 dice. He can use any number shown to place a life preserver onto the matching numbered lane. He can also add up the numbers shown on two dice or even all three dice to form a larger number – and then places a life preserver on that number. Of course, if he does so, he will not place as many life preservers on his turn. You must use all the dice. When you place a life preserver on a lane, you must place in on the bottommost space, pushing everything else in that lane upwards. Chips that are pushed off the board are given back to their owner. However, be careful not to push your own color life preserver out of a column. If you do so, you must take all of the chips in that lane, regardless of color. To further penalize you, you must place those other colored life preservers first before placing any more of your own color. 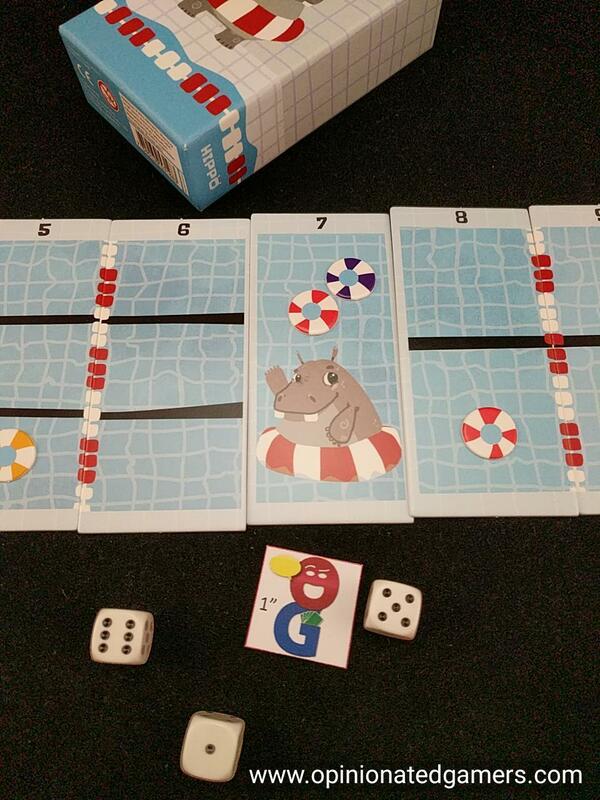 If you roll a 7, you can place a chip in the central lane with the hippo. You are also allowed to add up dice to get to a total of 7. There is no limit to the number of chips in the hippo’s lane. If you place a chip in the central lane on your initial roll, you are given a one-time bonus of a second roll. You cannot make a third roll, even if you place a chip into the 7 lane on that second roll. The first player to get rid of all of their chips is the winner. My thoughts – this is a nice light filler that is good with families. It is also good to help teach math skills and probabilities to kids. Each turn goes pretty fast – while it will take a little bit of time to calculate the different numbers, it should not be too much to handle, even for a younger child. You will certainly get to place more chips on the board if you use all the dice alone, but then they are also more likely to be kicked out quickly. The game, IMO, plays best with 4 players. The number of spaces on the board does not change, and for me, the sweet spot between space availability versus competition for those spaces is with four players. There are 28 total spots – which doesn’t seem like a lot when there are 48 total life preservers in the game, but every one that goes on the hippo spot is taken out of the game, and this helps reduce the overall number. With fewer players, there doesn’t seem to be enough bumping going on. Of course, YMMV with that. The art is clean and whimsical, and it should appeal to a younger gamer – and I think that this is really the target audience for this game. 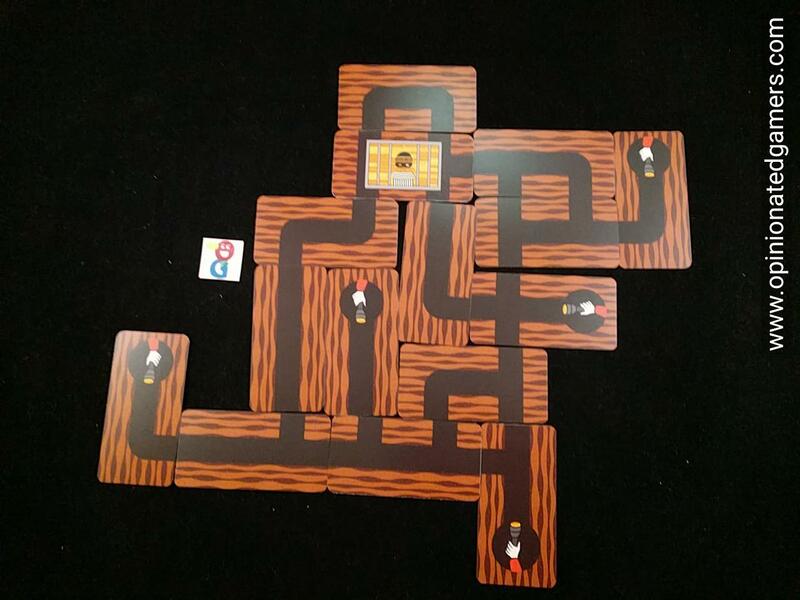 Bandido is a tiny pathway building cooperative game/puzzle (though it can also be played solitaire). 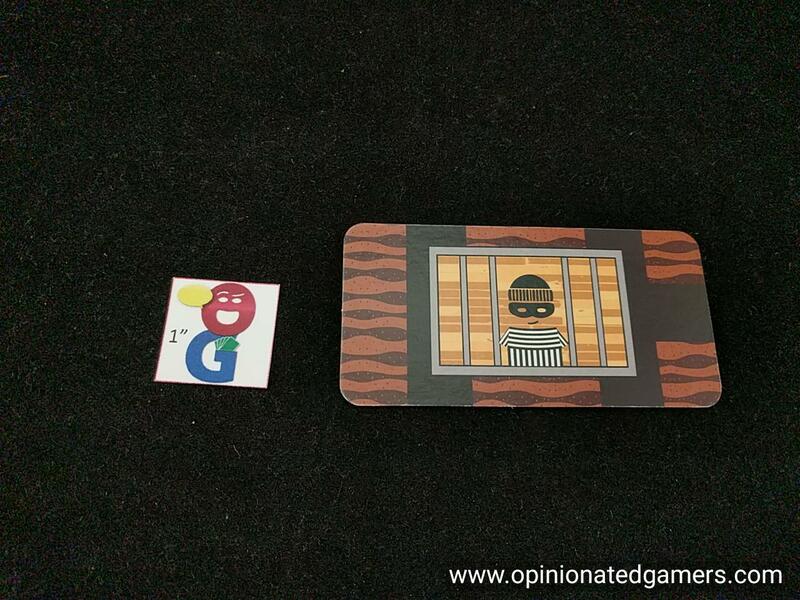 The entire game is card based – there is one start card which shows the Bandido on it. It is a double sided card – 5 exits on the easy side and 6 exits on the more difficult side. The Bandido apparently escapes from his cell all the time. The goal of the game is to create a network of tunnels which makes it impossible for the Bandido to escape. The 69 cards in the game are shuffled and each player is dealt a hand of three cards. The regular cards have different tunnels on them, each card having up to six possible exits – one on each short end and two possible on each long side. On a turn, the active player must choose a card to play from his hand. It is played to the table such that it connects up to the tunnel network already on the table. All paths must match up – you cannot cut off a pathway with a white edge of a card. If you cannot play, you discard your whole hand to the bottom of the deck and draw three new cards. The team wins if the network of tunnels is completed so that there are no open passages – that is, all the tunnels join each other and lead back to the Bandido. Otherwise, if all the cards have been played and there is still at least one open tunnel, the players lose. an example of a quick game. only 14 cards needed to close everything off! 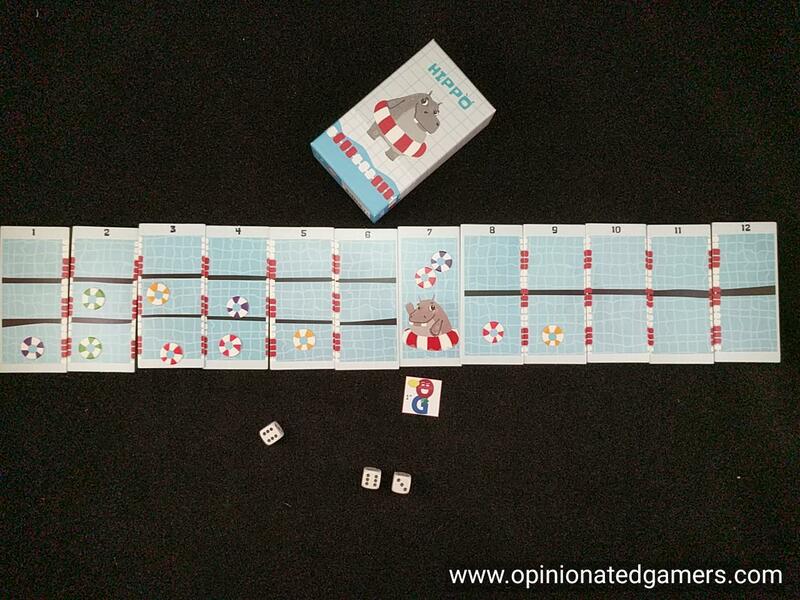 My thoughts – This is a very simple game, again suitable down to the young age of 6 as suggested on the box. The cooperative game itself feels straightforward. On each turn, you should try to play a card that reduces down the number of possible exits – or if nothing else, at least try to not generate more. Sometimes, this is impossible as you have to work with the cards that you have, but in the end, the goal of each turn is the same. When we play with all adults, it hasn’t been too hard of a challenge, though we have started to play without discussion to make it a bit more challenging. With kids, this game works well teaching them how to evaluate different paths and how to manage the cards. For myself, I have made a nice solo challenge out of it. I have tried to see how many cards I can play and still succeed in closing off all the loops – without running out of cards. Thus far, my best “score” is 65 – that is five cards left in my hand and the deck when I ended the game. I suppose I could have pushed my luck and tried to make it to the final card, but I didn’t peek at what was left in the deck to leave myself with something else to work towards in the next game. Neither of these games is going to be the focal point of your game day. But they are nice fillers or good games to keep in a travel kit. You might only have a twenty minute window to play a game between soccer games or in an airport lobby, but these can be easily packed and carried around for that right opportunity.